I delivered the following message to the Northern Humboldt Union High School Board of Trustees to no avail – they voted on July 6 to place a $25.8 million bond measure on the November 2 ballot. The issues raised in the message, as well as many others, are still relevant for voters to consider. This is another request that you decline to place a bond measure on the November 2, 2010 ballot until your constituents are more fully informed. It would be fiscal folly to spend district funds to proceed if, when fully informed, the voters would not support a bond. What you have in your packet does not include sufficient descriptions, specifics, or cost breakdowns to allow you or any member of the public, to make an informed decision, unless you want to create a $25.8 million slush fund to be whimsically used, with not even any priorities established. I don’t think any voter would agree to such a non-specific fund that would be subject to the whims of some undesignated person or persons. I am concerned that, although it was referred to at your last meeting, bond money could be used to pay off existing loans – basically refinancing on the backs of taxpayers. That’s another reason to delay a decision to proceed so that sort of thing can be decided. There is no disclosure in your packet of the huge costs to be paid to an architect, bond financier, and bond lawyer – another fiscal concern of the voters. The Jones Hall law firm should not be acceptable to the voters if they are reminded that Jones Hall was the law firm used by MUSD who made a big contribution to support the MUSD bond measure, in violation of Measure T and some very basic ethics. Their contribution had nothing to do with their support of better education for McKinleyville students and everything to do with their making money if the voters approved the bond measure. If you decide to make the unfortunate decision to proceed to place a bond measure on the November ballot, it will likely be shown there is more opposition than support by taxpayers. There are too many assessments on our tax bills now, and there will not be support for any more. There has simply been no proof shown of any critical needs requiring new assessments. It is natural for faculty and administrators of schools to want more and better everything, but there is a difference between wants and needs. Please do the right thing and do not vote to proceed with the bond measure. This Sunday we will celebrate and remember Independence Day, i.e., we will celebrate the act of a group of American colonial leaders who declared the 13 colonies independent of the British Empire. As I think about this event, I think about why our blood and cultural ancestors decided to break free of the British. They were, after all, literally our cousins, for at that time almost all of the colonists were of British descent and were tied in many ways to the rest of the Empire. Those ties were extremely important to the Americans and to the leadership which signed the Declaration, as abundantly evidenced in the document itself. But nevertheless Hancock and the rest did the deed and declared, in effect, that the British crown was a monstrous joke. But they did this not to separate themselves from the people of the Empire as a whole, but from the British ruling class and its very strange view that “property” is an absolute right, before which all other considerations must give way whenever they come in conflict with it. People starving while the British landlords in Ireland ship off the fruits of Irish soil? Too bad, the owners of the Irish farms so wish it and no other considerations may limit their property “rights.” American youth not being educated and as a result American industry being gutted? The litany of injuries which follows this statement is simply documentation for the fact that the British government had become destructive of the colonists’ inalienable rights and in so doing had lost its legitimacy as their government, i.e., the British ruling class and its ideas about property had become highly destructive of the values which legitimize governments. And now for the chase: are we the sons and daughters of Washington, of Jefferson, of Nathan Hale, of Alexander Hamilton, indeed, of all our blood and cultural ancestors who broke free in principal and for a time in practice of the notion that property rights are absolute and that they justify the destruction of human lives and spirits, or are we to be merely slaves and toadies, ignorant of our rights or, far worse, unwilling to secure them? For me this question and my answer to it must be the substance of Sunday’s remembrance. Watching the oil bleed into the gulf is heartbreaking. The pictures that British Petroleum did not want released of wildlife dying, coated in sticky oil, made me turn off the news. I believe we are now getting a graphic view of 2012, the end of this planet. She can take no more. If I were God I’d give Mother Earth back to the animals and the indigenous people that loved and respected her. I don’t see anyone in power doing anything to stop what is happening environmentally to our planet. Because big industry gives big money to government. To kill us all in the end. Or have we finally given up and handed the planet, worldwide, to governments that cater to big industry? The American Lung Association in California wishes to thank the City of Arcata for its leadership in supporting SB 375 and California’s clean cars program – two critical programs that will reduce harmful fuel use and promote healthier communities. SB 375 (California’s Sustainable Communities and Climate Protection Act – Steinberg 2008) will help California lead the way in encouraging alternatives to driving, including effective transit programs, more walkable communities connected by transit, and convenient and safe walking and biking infrastructure. Although our state has made progress in combating air pollution over the past 30 years, the fact remains that most Californians still breathe unhealthy air and remain at risk for respiratory illnesses and even premature death. Air pollution is particularly harmful to our most vulnerable populations, such as infants and children, the elderly, or those suffering with chronic illnesses like asthma or heart disease. Unfortunately, global warming is expected to worsen these problems by further threatening the quality of the air we breathe. As transportation sources represent the largest contributors to greenhouse gases, smog and other air pollutants in our state, we must remain focused on reducing harmful petroleum fuel use. Promoting more compact, transit oriented communities and implementing stronger standards to reduce vehicle emissions will advance California’s fight against global warming and air pollution and protect our quality of life. Thank you for your leadership in supporting these critical clean air regulations to reduce greenhouse gases and promoting cleaner and more efficient vehicles in California. Gee, get it together! I was walking by the Co-op and saw a 6 inch deep crater in the middle of a lane. You might be spending too much on the police. They could do a better job. I mean why do they call them “Pigs”? Have the Police fixin’ some of the holes. Instead of picking on the weak. I just don’t enjoy coming to Arcata to shop as much. 9% and the meter maid and the bad vibe cops. Note: In February, after several warnings, our friend George got a ticket for riding his “Trikke” scooter on a Plaza sidewalk. The “body-powered” three-wheeled vehicle, legally considered a skateboard, requires the operator to widely swerve, or “carve” to the left and right, and translates this energy into forward motion. It looks like a lot of fun, unless you’re a pedestrian in its path. Ever since then, George has been sending in letters disparaging the police and Arcata in general, and threatening to withhold his purchasing power. And yet, you can still see him swerving around on Plaza-area sidewalks on his Trikke from time to time, inviting further enforcement from cops charged with keeping the walkways safe for those who would walk, rather than ride on them. George is also firmly ensconcing himself in the burgeoning pantheon of local peaceniks who have no problem casually referring to their fellow humans as “pigs” and suchlike, but hey, maybe rhetorical consistency is overrated. Anyway, we repeatedly asked George where the six inch-deep pothole that he refers to is, but got no response. A search of the streets around Co-op proved fruitless. We did find some pavement in bad shape back behind the store, where big trucks make deliveries. But even wedging a ruler into the deepest crevasse returned a depth of just two inches. 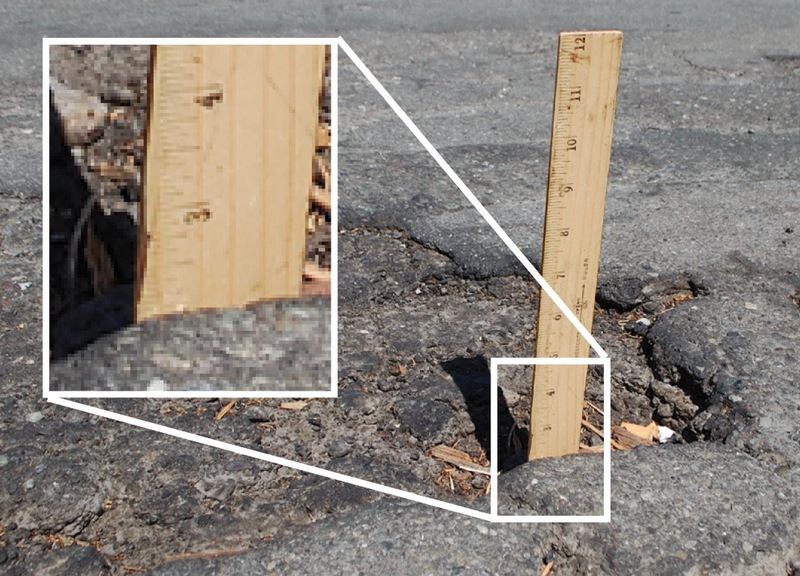 So, maybe there is a six-inch “crater,” maybe the sidewalks should be scooter thoroughfares, maybe the sales tax is too high and maybe the cops are “pigs.” We only need some evidence of all this. – Ed. Now that all the votes have been counted and we can look forward to November, I would like to express my gratitude to those who have supported me in my bid to become Humboldt County Assessor. I am touched, proud and grateful to everyone who volunteered, endorsed, donated, came to meet me and voted for me. Thanks to everyone who took the time to vote in the primary election. There have been some good issues raised by my opponents, particularly the need for improved access to assessor information. I am working hard to address this and you may expect assessment information to be available online in the not-too-distant future. Open lines of communication with the public, businesses, and other government agencies will be a cornerstone of my campaign and my office if I am elected. My introduction to the political process has not been an easy one and without the support of people too numerous to mention here I would not have made it this far. I will continue to work hard to be worthy of your support and hopefully gain the confidence of more of the voting public. Thank you again for all of your support. I’m looking forward to your vote in the general election this November! Nice to see the uptick in your ad sales due to the cannabis coverage, I imagine that feels good after being boycotted for so long by grow-related businesses for simply doing your journalistic job. I applaud the recent efforts by the cannabis community to get a grip on how to handle the future, with or without pending legalization. However, as some have tried to state in such a way that people will actually listen, this continues and will continue to be a complex issue and we all need to keep an eye on taking care of the community. • Industrial-sized indoor grows in residential neighborhoods continue to be a blight on our community, taking houses out of the market for families to use, ripping apart the insides of homes and bringing criminal elements into once quiet and friendly neighborhoods. I know it is now the popular thing for everyone to say that they don’t agree with industrial indoor grows, but I haven’t heard much from the industry about what they will do about them and the pollution they create, other than advocate for organic. Allowing people to grow in their homes for their own use or having a caregiver come into their home to grow for their own personal need is one thing, but using a house to grow for a medical cannabis collective or to sell for profit is an abuse/misuse of our community resources. • Indoor grows work against the energy-efficient credo of this community. Humboldt County energy use has risen 51 percent since Prop 215 was passed in 1996 (and no, that was not due to a huge population increase). Indoor grows can use up to 6 times normal residential usage. • People are hoping to turn this into the Napa of marijuana. That is fine from a marketing perspective, but what does it do for the people of Humboldt? Last time I looked, farm workers in Napa don’t make much money and the property and profits belong to a few, not to mention the impact of chemicals on Napa’s land and water. Anyone who listens to KHUM at all knows that Trim Scene Solutions is already pointing the way for growers to lessen the hassle and labor costs of trimmers. What are we going to do to help those people find jobs? • What will we do if legalization is passed in November, but people continue to grow for the out-of-state black market? • If Prop 19 passes, how will the county and individual cities in Humboldt work together to ensure there is a consistent manner of regulating, controlling and taxing marijuana, so that everyone is on the same page, with no confusion for the DA, the police departments or other regulatory agencies. Hopefully, these entities are working together on this NOW. • As a community, how much energy will we invest to be sure we don’t succumb to another monoculture? That’s it. Good luck to us all, let’s take care of each other and not simply pay attention to our own selfish interests. Several months ago i stood before the council and pleaded my case before the city of council regarding the closure of Footprint Recycling biodiesel plant. The council subsequently convened a special session to discuss the situation a week later. Now several months later it appears that is all that happened, talk. Meanwhile highly toxic oil is now bleeding on America’s shores, rivers and on the land through a series of oil spills throughout our country. In addition another local fuel business, Big Tire & Oil has been slapped with gross violations due to contamination of our water and soil due to underground tanks leaking highly toxic diesel and gasoline. Have they been served a “cease and dissist” order? And the spill that caused the city to slap Footprint recycling with a “cease and dissist” order (whatever minute amount may have gotten past their vacuum pump hoses) has all biodegraded into worm food 3 months ago. And over a thousand biofuel users in our community are distraught and many are said to be wanting to get rid of their TDI VW’s and other vehicles because it is virtually impossible to acquire biodiesel anywhere within 175 miles. And “Dino” diesel is stinky and toxic. My business and others have suffered due to the rapid and seemingly inexplicable shutting of Footprint’s doors. It has cost me many extra dollars and time to seek out and acquire small amounts of fuel from extreme distances. So i ask once again, “What is going on? ?” Why is the city dragging their feet? Why can’t Footprint resume production while they find and build a new location? Why can’t they at least fill their existing tanks with biodiesel made in another location to sell at the retail level? Why can’t Arcata stand up and be part of the change toward domestic renewable fuels? Are we just going to stand by and lose this valuable local resource because of bureacratic bungling? That is what it looks like from our standpoint. I just wanted to say thanks to you and the Arcata Eye. The Hospice Shop has advertised in a number of publications and we rarely hear any feedback form the advertising. Since we have starting running ads in the Eye, we have had many comments that they saw our ad in the Eye. You obviously have many readers that notice what you are printing, good job and congratulations! Or maybe use this doggerel crap. This entry was posted on Tuesday, August 10th, 2010 at 9:49 am	and is filed under Opinion. You can follow any responses to this entry through the RSS 2.0 feed.